It’s tempting when addressing The Two Worlds of Charlie F to autopilot to the old ‘art versus entertainment’ dichotomy, and labour over issues of the potentially and arguably more altruistic responsibilities of theatre. This is certainly one such show that could fuel fire to any such lofty debate - should we demand more of our theatre-going experiences other than abject escapism? Should there be more impacting and thought-provoking experiences that tear down the fourth wall and address more stark realities, utilising the stage not as an isolated, distanced lacuna of fiction and fantasy but rather an arena to directly address and involve an audience in the exploration and demonstration of actuality and truth? The Two Worlds of Charlie F seems to think so, or at least partially. Bravely and confidently enveloping the audience from the offset, its decidedly original approach completely blurs the lines between artifice and actuality. 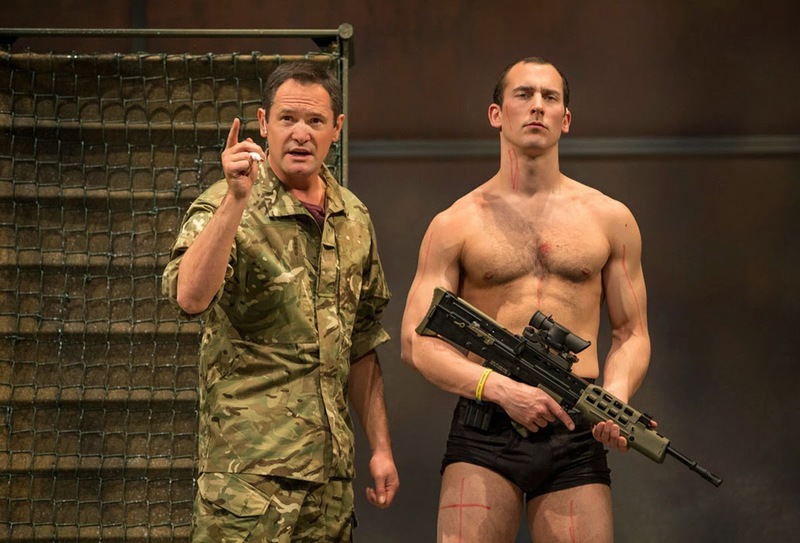 A company of ex-servicemen shares the stage with a handful of actors and performers, deliberately muddying the borders of where actual testimony and real-life accounts end and dramatisation and fictitious re-imagining begin. Over the course of the evening, the show charts the journey from aspirational young recruits, exploring the myriad of reasons why individuals may choose to enlist, through to the harsh realities of military life itself and eventually the trauma and hardship, in so many different variables, of those who return home from action wounded and scarred both physically and mentally. The show maintains a sense of pace by essentially being a series of different thematic vignettes linked by character and intent, though the variety can at times come across as more than a little tonally incongruent. Where one minute a direct geo-political address on the state of foreign affairs in Afghanistan imbues an authoritative, almost conference approach to the show, the next moment may see a contemporary dance routine explore the strain of post-traumatic stress on a romantic relationship, or a more conventional sing-a-long has a scene with an overly abrasive drill-sergeant coming across as something torn from an R-rated Rodgers and Hammerstein. 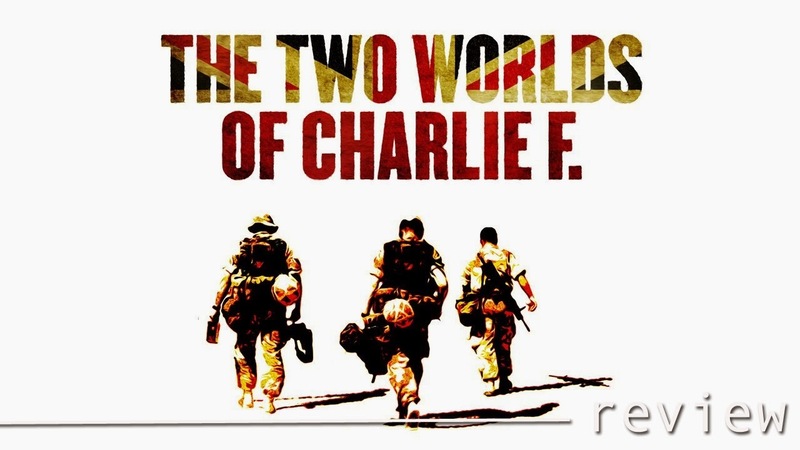 On the one hand, The Two Worlds of Charlie F should be applauded for its invention and creativity, exploring its issues and premise with such a varied, vivid and artistic touch, and it is perhaps in some ways fitting that the mishmash, eclectic nature of it all is perfectly fitting for a show which continually emphasises the mayhem, confusion and diversity of war trauma. However, this is a show which, unsurprisingly, works most effectively in focus and stripped of any such theatrical excesses. 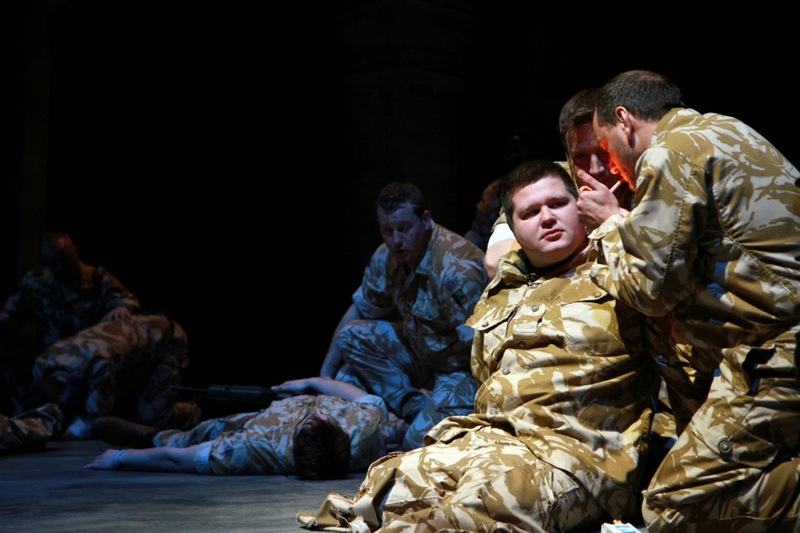 So much of what is seen on stage has an incomparable impact by dint of it being genuine ex-servicemen and women performing that it sings with an authenticity that makes so much of the extra flourishes seem completely superfluous. The scenes and sequences that are the most aspirational creatively are often, subsequently, the least engaging. This is a show which is above all about humanity and experience, and one that admirably neither admonishes nor glorifies war or wartime heroics. It is almost impossible to not feel a tremendous swell of pride and admiration for all involved, and one wholeheartedly feels the gravitas and impact, not to mention some sobering realities, of Charlie F’s intent and message - what you are seeing and hearing may be horrific, but it is lived through by people just like you and I. There are no divisions, this is not a separate world we only see in fiction, on film or, of course, on stage, this is all indicative of and born from harrowing reality. The question remains though as to whether The Two Worlds of Charlie F is a traditionally ‘enjoyable’ evening worthy of recommendation for the general theatre-going crowd, and indeed it is an oddity of an evening to pigeonhole. As mentioned, it is kaleidoscopic in its creative approach almost to the point of frustration, with the handful of musical numbers in particular being the most egregious and jarring offenders. One feels the weight and indisputable importance of what it is saying, and are instantly won over by its admirable company, but at the same time as a piece of constructed theatre it tries to be too many things at once to overly succeed as any. Ultimately, The Two Worlds of Charlie F rides on a crest of utmost respect and dignity. 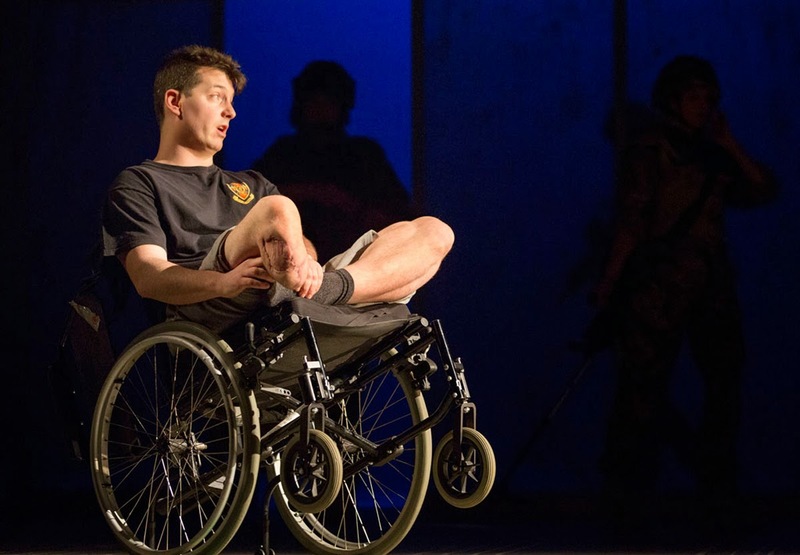 There is a weight and impact to what is being shown and said that should belie any theatrical shortcomings, and those with any military experience or connections will likely find an even further moving and involving experience here. If, however, you are seeking the traditional escapism and entertainment offered by theatre, then at the very least brace yourself for a far more sobering, but potentially enlightening, affair. Regardless, be sure to join what was practically the entire theatre for the inevitable standing ovation, for this is a company of inspiring individuals that, irrespective of the shows individual artistic merits, wholeheartedly deserve it. THE TWO WORLDS OF CHARLIE F is running at the Wolverhampton Grand Theatre from Wednesday 26 to Saturday 29 March 2014. Press tickets for this performance of The Two Worlds of Charlie F were provided courtesy of Wolverhampton Grand directly. (A)musings Media gratefully acknowledges their generous invitation.